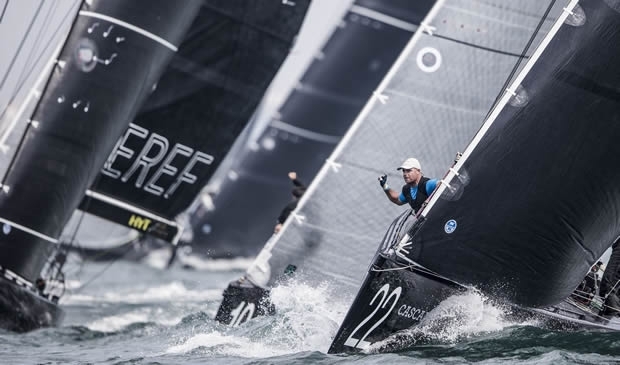 After a light start to this regatta, conditions finally came good with the breeze building into the high teens for day three of the RC44 Cascais World Championship. A different winner in each of today's three races, a new overall leader in Vladimir Liubomirov's Bronenosec Sailing Team and just two points separating the top three boats at the close of play, gives some indication of how close this clash of the titans is. Hooking the weather mark yesterday and a problem with a jib halyard immediately before today's first start, seemed not to phase Torbjörn Törnqvist's Artemis Racing, as the Swedish America's Cup crew fought its way to the front in race one. As new boy in the team, Italian tactician Francesco Bruni described it: "Off the start we were in good shape, we won the committee boat, tacked and were still in good shape. We were third at the top mark, we did a very good first downwind and were even at the gate. Then we had a good second upwind and stretched it out a bit - it was very good." In fact this tactic of heading right towards the coast paid throughout the day. Bruni disclosed: "There is a 10 degree bend in the breeze when you go towards that side and it is pretty much like that all the time. Sometimes there's a tidal gain there too, but today it wasn't very strong." Posting a 1-10-7 today, Artemis Racing is still struggling for consistency, most of this due to issues starting. "We are sailing quite well and we had a good start in the first race, and we had good speed upwind and downwind. The second race we had a bad start and in the third race we had a penalty after the start, but at least we sailed up through the fleet," said Torbjörn Törnqvist. While this RC44 Cascais World Championship has a new leader in Bronenosec, today in fact Team Nika was standout, top scoring boat of the day, posting a 3-1-2. This has moved her up to second overall – despite scoring 11 points in yesterday's first race. As was the case for Artemis Racing in today's first race, Team Nika claimed race two by 'winning' the committee boat and heading inshore to the favoured right. Tactician Dean Barker recalled: "We had a really nice start, it seems like we've got really good speed, and the boat handling seems great, which is encouraging. It's definitely a place where you have to start well. "Generally it was a good day. After yesterday's first race, it was a bit disappointing. The first one today, we felt like we had second place wrapped up and then just dropped one on the finish, but that was the only blemish." Team Nika's Vladimir Proshikin was in jubilant form: "It was good fun today, a very nice day. Somehow everything was in one piece - our starts were really good and our boat speed is very good and we had very good team work. We found our path up and down - we didn't get lost!" Team Nika finished the day in second place overall, just one point behind Bronenosec, with whom they seemed to wage a small private battle throughout the day. Perhaps the best news for the event and for the Class was that former RC44 campaigner and leading Portugese businessman Patrick de Barros won the final race of the day on board Team Aqua. De Barros, RC44 Championship winner in 2008 when circuit founder Russell Coutts was calling tactics for him, was a late stand-in for Chris Bake, who has been held up with business commitments. "It was the typical thing if you make a good start and have good speed," said De Barros of his victory. "We improved a lot from yesterday when we made some tactical errors, but today we had a good start. I know the field, so we started at the committee boat and tacked as soon as possible. Cascais is a fantastic racing area, but in most cases in the north-northwest wind it is a speed race." De Barros said he was pleased to have been able to sail with the Team Aqua crew. "It is a very excellent crew with Cameron [Appleton] and these guys - they are top class. It was a pleasure to sail with them." Tomorrow Chris Bake returns to take over the helm. The forecast for the penultimate day of racing is once again for a sea breeze to develop in the afternoon, but when and how strong it will be remains to be seen.